Both humans and fruit flies are classified as eukaryotes, carrying their genetic material in a distinct nucleus located within each of their cells. 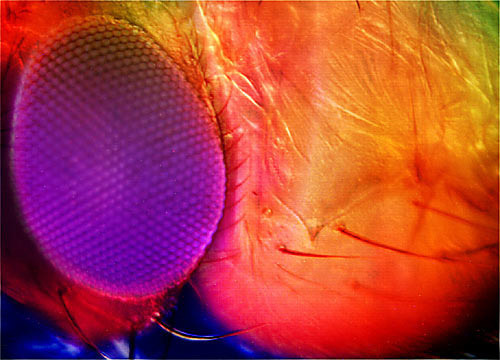 Because of this common denominator, the fruit fly, having a very basic level of physiology, is used as a model organism in studies that are applied toward deciphering more complex processes such as those found in humans. Primary areas of application include cellular, developmental, and genetic investigations. Additionally, fruit flies are inexpensive, reproduce easily, and have short life cycles — all factors adding value to their use in model systems research. Currently, the wealth of information that has accrued through longstanding scientific investigation of the tiny insect is being greatly increased by efforts to sequence its genome. Indeed, a number of genes attributable to the fruit fly are very similar to those found in higher eukaryotes, and biomedical researchers are looking toward the fruit fly for clues in understanding human diseases.